Guest post by Mark Borland of Godfrey Roofing Inc, an Ottawa roofing contractor specializing in environmentally-friendly roofing solutions. As the trend towards environmental awareness continues to grow – both in Ottawa and around the world – many businesses and institutions are looking for new and innovative ways to incorporate green space into their facilities. One of the most popular ways to do this is by installing a ‘green roof,’ where a normal building rooftop is transformed into a garden, providing benefits to both the building’s owners and the environment. Ashbury College, one of Ottawa’s most innovative private schools, decided to take green roofing to a whole new level by transforming 3,800 square feet of rooftop into an outdoor classroom. There were several objectives of this new green roof: to involve students in the planning & implementation of an environmentally-conscious project, to create a green space where students could read and learn in an outdoor classroom, to replace an aging roof with one that would last longer and lower the school’s energy bills, and to reduce the school’s environmental impact as a whole. In general, green roofs offer many advantages over traditional roofing systems. There are substantial savings in the cost of heating and cooling buildings that boast green roofs (sometimes up to 50%). Green roofs lengthen the life span of the structural underlay that supports them by as much as two fold, meaning less rubble ends up in local landfills. And each new green roof installed in Ottawa helps to reduce urban heat island effect – a climate condition that is potentially life threatening. Green roofs improve air quality, and reduce storm run-off by absorbing precipitation. And let’s not forget about the daily benefits to students and the nearby community, either: a rooftop that was previously forgotten is now a pleasant new green space for students and staff to enjoy. The new garden roof area at Ashbury College is separated by a custom built walkway over four quadrants of the green roof. The four quadrants are made up of a wildflower flower bed, a groundcover flower bed, a grass and fern flower bed, and a vegetable flower bed. 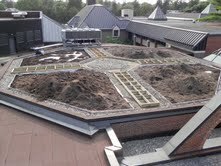 The system installed is a high quality modified bitumen roof system with traditional green roof components built above. This rooftop oasis will become one of the first outdoor classrooms in Canada, and will be maintained and planted by the students. Clearly, Ashbury College is one of the first Ottawa institutions to embrace the benefits of green roofing – hopefully more businesses will follow suit, making our city a healthier, greener, more pleasant place to live. Now all you need is a beehive. I can help with that!